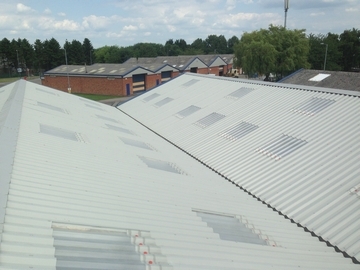 This project was an overclad of the existing asbestos cement roof. Insulation values were also upgraded to modern standards with the existing skylights framed and secondary glazed with triple wall polycarbonate panels prior to the installation of the new roof. Colormet profiled sheeting was then installed, with Brett Martin 'ManSafe" GRP skylights. Careful sheet selection and setting out before the installation of the roof allowed for these new skylight panels to coincide with the existing apertures. 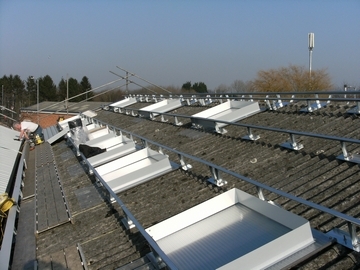 Central valleys and boundary gutters were also lined with Sharman's Plygene Gutterline systems. The concrete purlins posed a particular problem, but this was overcome by the use of auxiliary brackets bolted to the purlins, onto which a GridTite post and rail system was fixed. "Had to write to thank you and your team for a great job done on our roof. From enquiry to completion conducted in a very professional and courteous manner and completed within the schedule. What more could we ask,thanks again."